Samsung’s Gear Fit 2 gained a lot of plaudits, which makes launching a ‘pro’ version something of a challenge. After all, the core of a good wearable is having a strong range of core features accessible via a clean and uncluttered UI that doesn’t require a lot of menu navigation, and a hardware design that’s both robust and stylish. The Gear Fit 2 hit the mark on all of those, so where does Samsung take its Pro version? Samsung has found several ways to offer more with the Gear Fit 2 Pro — but can it justify the £209 (inc. VAT, or $199.99 in the US) price tag, when the Gear Fit 2 is currently available for around half that? Several fitness apps are installed out of the box — MapMyRun, SpeedGo, UA Record and Endomondo — and there’s also a Speedo app that will record some swimming metrics. 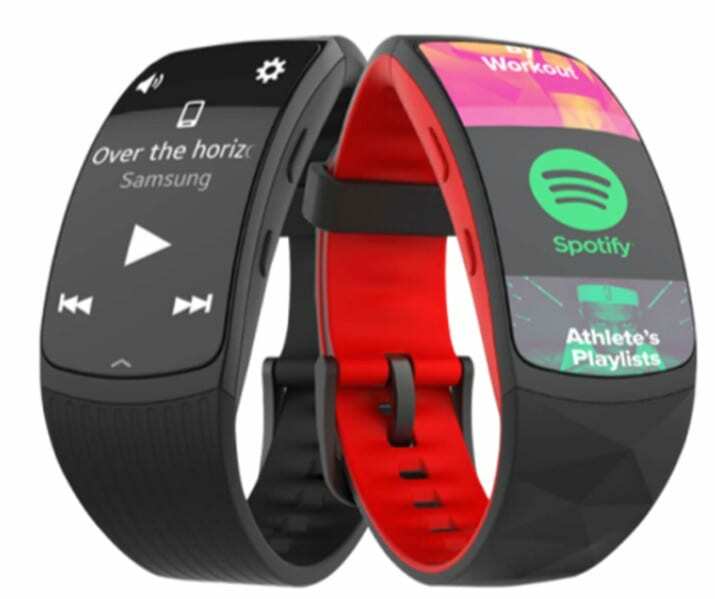 If any of these apps are of interest, you may be tempted by the Gear Fit 2 Pro. The other key new feature is MIL-STD 810G certification and ability to withstand 5 ATM water pressure. This is quite a step up from the Gear Fit 2’s IP68 rating and should make a big difference if you’re interested in watersports — or just want to wear this device in the shower. Music fans may also appreciate support for Spotify’s offline mode to send tunes to wireless headphones, but unlike the fitness apps, this isn’t preinstalled. The Gear Fit 2 Pro has a superb 1.5-inch AMOLED screen and fastens using a traditional watch clasp. It costs £209 in the UK or $199.99 in the US. Sit a Gear Fit 2 and a Gear Fit 2 Pro side by side and you’ll be hard-pressed to spot the difference. The design is remarkably similar, although the new model uses an old-fashioned watch clasp rather than the older device’s somewhat less secure slot fixing method. As far as I’m concerned, that’s progress. The 1.5-inch, 216-by-432-pixel AMOLED screen is absolutely superb — bright, sharp, clear and easy to read. I’ve not seen better, in fact. Even though it’s on the large side for my small wrist, I’m happy to make the trade-off in return for improved readability. The screen can be tapped and prodded, and there are two side buttons as well. The combination of tactile and button features make navigation straightforward. There are plenty of fitness features, including a heart rate sensor on the back and GPS so that routes can be tracked. The Gear Fit 2 Pro can measure heart rate, count paces, indicate calorie burn, count floors climbed, and can track specific activities such as running, swimming, hiking, cycling as well as various bits of gym equipment. There is handset connectivity for alerts and music playback, as well as 2GB of internal storage available for tunes (and Spotify support). Metrics galore, and historical data are available via the Samsung Gear Fit and Samsung Health apps. Samsung has thought carefully about how to get the best from the screen, and I was never too far away from the setting, or information widget I wanted. The coffee-drinking widget was new to me, and long-term it might help me cut down. The display is so good that I even used it to check my schedule for the day — something I don’t normally bother with on wearables as the screens aren’t really up to the job. There’s also a multitude of watch faces to play with. Battery life is rated at 3-4 days of typical use, or 5 days of ‘low usage’, and up to 9 hours of GPS time. That means that most users won’t get a weekend away from mains power out of the Gear Fit 2 Pro. The charging stand is a bit cumbersome to carry around, but the good news is that while there are just two charge nubs on the device itself, there are four on the stand, so you aren’t forced to mount the device ‘the right way up’. Magnets pull the Gear Fit 2 Pro into the right position for charging, and the screen reorients to display the time horizontally whichever way you place it on the stand. Battery charge level is also clearly shown, making it easy to see if a boost is needed. If wearables must have proprietary chargers, then at least Samsung has worked out how to make the Gear Fit 2 Pro’s easy to use. There’s a lot to like about the Samsung Gear Fit 2 Pro. It’s well designed both in terms of usability and features, the screen and user interface are both superb, and the well-designed (if proprietary) charger is a real plus point. Battery life may be an issue for serious users, who will probably need to charge the device daily. Although the Samsung Gear Fit 2 Pro is an impressive device, it’s hardly a major departure from the previous model. Posted in Tech Corner, Tech Corner and tagged #samsung, 1.5-inch AMOLED, 2GB of internal storage, 5 ATM, AMOLED, certification, charging stand, coffee-drinking widget, docked, Endomondo, fitness, GB of internal storage, GPS, heart rate sensor, IP68, IP68 rating, justify, MapMyRun, MIL-STD 810G, Pro version, Samsung Gear Fit, Samsung Gear Fit 2 Pro, Samsung Health apps, SpeedGo, Speedo, Spotify, Tougher, UA Record, water pressure, Waterproof, watersports.